Provide comfort for the family of Charles Mossow with a meaningful gesture of sympathy. 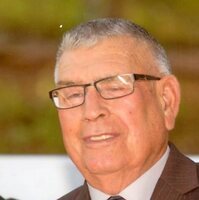 MASSENA – Charles H. Mossow, 84, of Horton Road, passed away early Monday morning, April 1, 2019 at Massena Memorial Hospital after a brief illness. Chuck was born December 28, 1934 in Norfolk, the son of the late Clarence N. and Alice (Francis) Mossow. He attended schools in Norfolk and Waddington. In 1957, he was drafted into the US Army, where he served his country until his honorable discharge. On May 14, 1960, he married Phyllis M. Green at St. Lawrence Catholic Church with Father Wilfred Nugent, officiating. Chuck worked for a time for Red McLean Trucking before starting to work for the Village of Massena Department of Public Works where he retired as a Heavy Equipment Operator. He was a parishioner of St. Peter’s Parish, where he regularly attended St. Mary’s Church. He was also a member of Massena Senior Citizens and Gerald R. Roy AMVETS Post #4. Chuck loved spending time outdoors, going to the casino, taking bus trips, and visiting with his family and friends. He also cherished the time he was able to spend with his family, especially the sporting events of his grandchildren. Chuck is survived by his loving wife of nearly 59 years, Phyllis; his children, Terry and Margaret Mossow of Haw River, North Carolina; Gina Boyd of Canton; Marty and Karen Mossow of Massena; Patti Supernault of Brushton; and Kim and Michelle Mossow of Massena; his grandchildren, Sarah and Jason Verrett, Emily and Jesse Fletcher, Justin and Lindsay Supernault, Christian Mossow and his fiancé, Karina Solis, and Caleb Mossow and his great grandson, Jacob Charles. He is also survived by his step grandchildren, Kaylene and Toby Lunan, Brandon and Ago Supernault, Megan LaDuke, Jenna Morris, and Loran LaDuke; several step great grandchildren; his sister, Lorraine and Robert Miller of Massena; his brothers, Donald and Mildred Mossow of Massena; Leland and Lorraine Mossow of Norfolk; and Bernard and Mary Mossow of Massena; and many nieces, nephews, and cousins. In addition to his parents, he was predeceased by a son-in-law, Terry Supernault on September 9, 2009; a brother, Lyle Mossow on July 25, 2014; and a sister, Aletha Hines on December 28, 1998. Friends may call at the Donaldson Funeral Home, Massena on Wednesday 3-6:00 PM. A Mass of Christian Burial will be celebrated Thursday 11:00 AM at St. Mary’s Catholic Church. Burial will be held later in the spring in Calvary Cemetery, Massena. In lieu of flowers, those wishing may consider memorial contribution to Hospice and Palliative Care of St. Lawrence Valley, Massena Volunteer Rescue Squad or Seaway Valley Ambulance. To send flowers in memory of Charles H. "Chuck" Mossow, please visit our Heartfelt Sympathies Store. Jill Murray and Judy Jackson sent flowers to the family of Charles H. "Chuck" Mossow. I’m so sorry for the loss of this man. My condolences go out to the Mossow family. There’s a Scripture d love to share that always comforted me when I lost someone close to me in death. It’s in Revelation 21:4 which causes says: “And he [God] will wipe out every tear from their eyes, and death will be no more, neither wklll mourning nor outcry nor pain be anymore. The former things have passed away.” This is a promise from God they he will end death forever in the future and we will see our loved ones again!